In the mid-1990’s, after many years of work as an architectural drafter, then job captain and project manager, I was given the responsibility of managing architectural production for a firm that was growing quickly in order to handle an increasing workload. I had to make a change from doing much of the work myself and supervising just a few individuals on a single project to managing several teams on several projects that were being developed simultaneously. In making that change, I became a member of a club of architect employees who are promoted into management positions with little or no management training. I had performed well in my technical role, so it was assumed that I was fit for a management role. But most of us who enter management from a technical background are not fit for management without further training. We may know the technicalities, but we may have a tendency to impose our own methods on others or may have a desire to do the work ourselves, and our attention to detail can undermine our effectiveness as managers. While it may be possible to both manage others and do some of the work in a situation where the team is limited to a few persons, the ability to manage effectively (while also doing the work directly) diminishes as the size of the team increases and as the number of simultaneous projects increases. The focus for work you do directly, yourself, comes from your own technical experience, and you are likely to follow the well-worn paths of your learned work habits with little or no need for explanation. There may be a little voice inside your head asking questions and commenting like an alter ego, helping to guide your approach, but you are for the most part working independently and not through others. Managing the work of others requires a different focus and a different set of skills. A manager of architectural production must focus on matters that affect the work of others - teams, reporting team leaders, and team members. Are your (management’s) expectations clear to them? Are the team leaders and team members getting the information they need to do the work? Do they have the facilities and equipment needed to do a job that meets expectations? What kinds of training might be needed? Are there better ways to organize the work in order to meet schedules and production budgets? Have communications been developed to account for different personal communication styles or other personal differences (e.g., experience level, professional interests, language, and cultural background)? With a diverse work force, you must expect a need for diverse forms of communication and direction, diverse levels of detail in communication, diverse forms of training and supervision, and a need for effective conflict management. A strong technical background can be useful as a limited reference –a source of suggestions, coaching, or mentoring, and knowledge of at least part of the work that needs to be done – and also as one gauge of the work product output of others. The manager’s work task is management – getting the work done by and through others. As a worker, if you are responsible for a technical task, that is your focus [to diagram it, draw a circle around the task as shown below]. As a manager, your focus is the work of others. Your task encompasses those workers and their tasks [draw your task circle around the others and their tasks as shown below]. Their success is the measure of your effectiveness in your job. In other words, the purpose of your job as production manager is their success in meeting your firm’s expectations. Many of us have tried to maintain a hands on-approach by doing some tasks ourselves while managing others. And we have then expressed frustration over the ineffectiveness of others at the same time that we are diverting our own attention from the job of management to practice our own favorite activities (e.g., drawing or writing specifications). 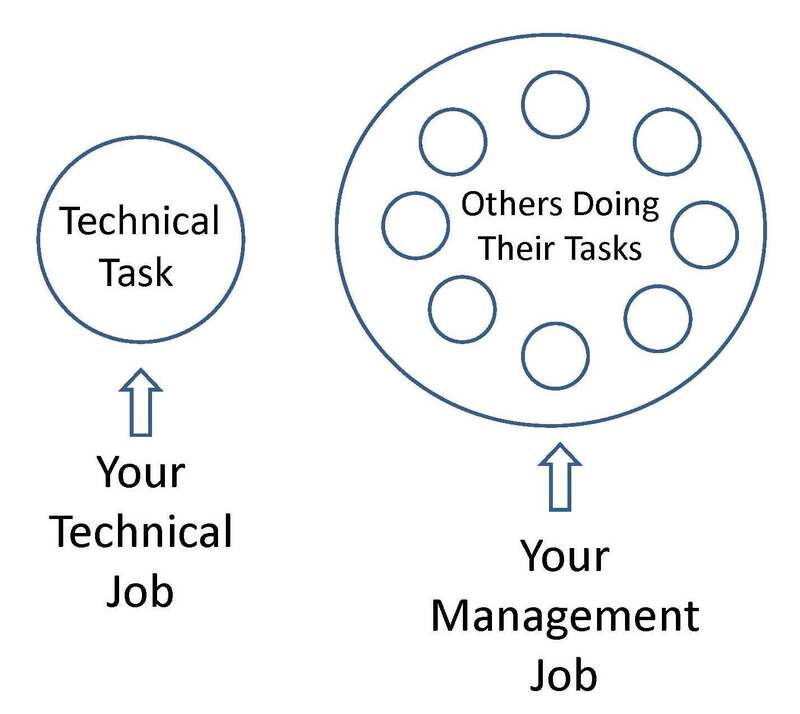 Clearly, one of the reasons for our failings in management is that we do not make it our first priority and do not spend enough of our time managing, choosing instead to flee into technical work, where we feel more competent. The antidote is to realize that management is in itself a necessary job, and that others depend on our effective management to complete their work.